In July, I spoke at several climate change education events which were organized by Stan Kozak for the Ontario Teachers Federation. Following the McMaster event, teacher Anthony Corvinelli, contacted me to find out whether teachers could use “What’s bothering your green conscience?” to spark cross-disciplinary learning in schools, at the elementary and secondary level. This post is my answer to that question. 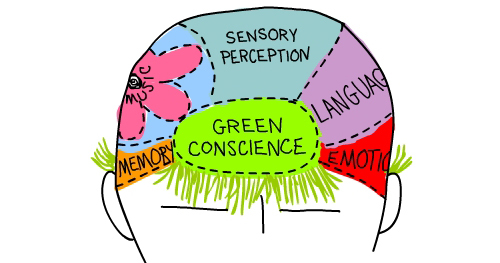 It’s an overview of the green conscience concept, with an exercise idea at the end. It also inspired me to create this visual essay, The Beehive and the Hairball. 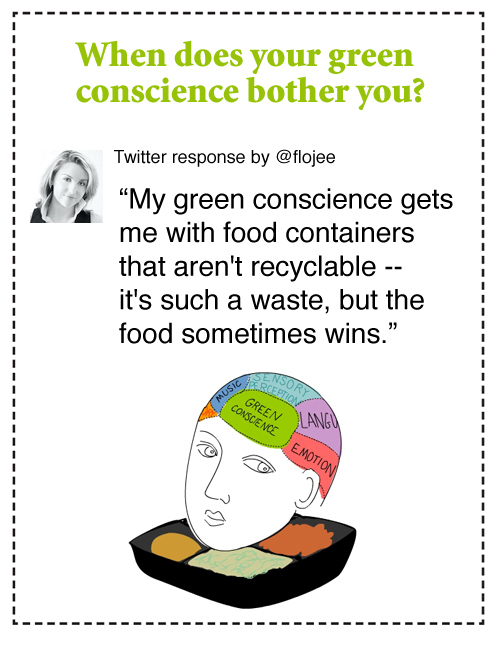 What is a “green conscience”? And do you have one? 1. Do you feel guilty if you throw paper in the trash, instead of recycling it? 2. Do you turn off lights to save energy? 4. Do rising CO2 emissions from cars, planes and other sources concern you? 5. Do you worry about climate change? 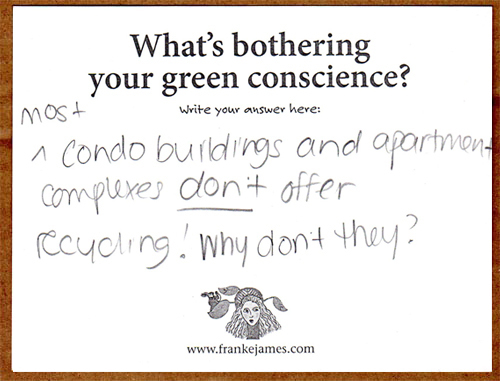 If you answered “Yes” to any of these questions, you may be developing a green conscience. Amazing things happened to me when I started listening to mine. Since 2007, I’ve taken action by selling our only car (an SUV), challenged City Hall for the right to build a green driveway — and then built it as a long weekend DIY project. 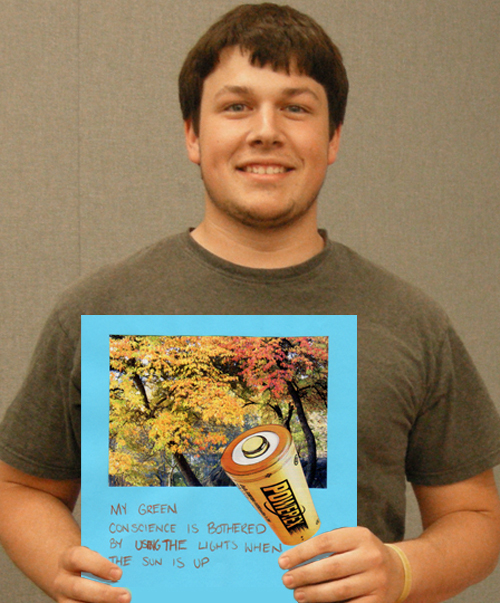 I’ve combined five of my visual essays into a book called Bothered by My Green Conscience. 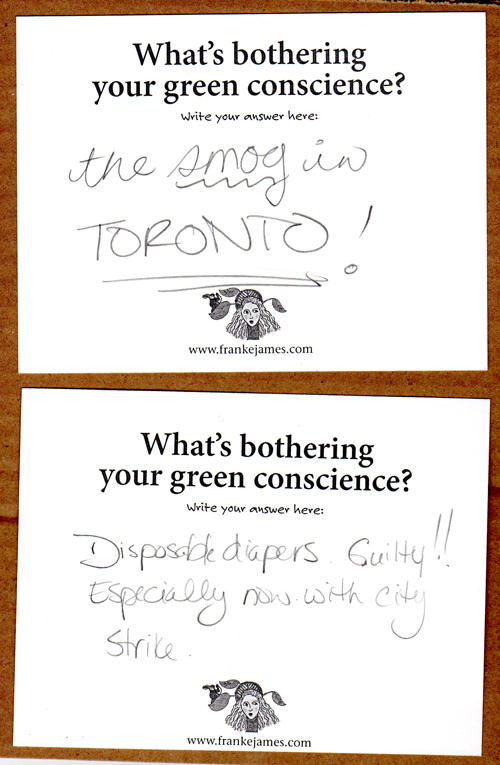 So, it was weirdly ironic that the debut of “Bothered by My Green Conscience” actually tested my green conscience! Check out “No One Will Know, Except You” to understand what I mean, and how it relates to environmental action (or inaction!). There was no shortage of things nagging at people. And I could identify with lots of them! 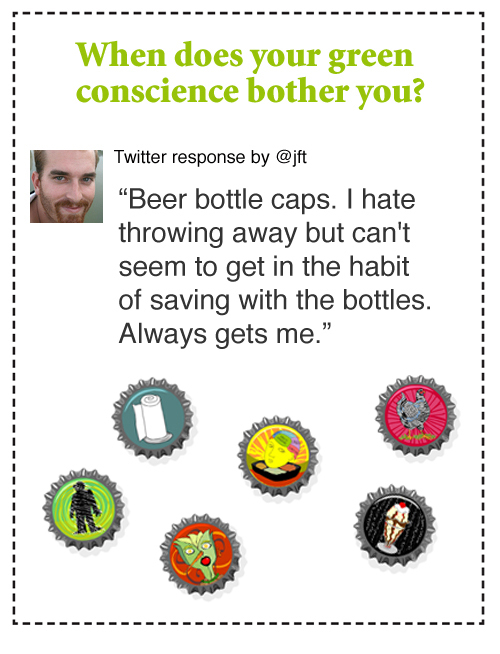 Not being a beer drinker, I’d never thought about beer caps not being recyclable, but I could see that being an annoying problem. UC architecture student DJ said, “My green conscience is bothered by using lights when the sun is up.” Hmmm… buildings that don’t need lights on in the daytime? What a great idea! I didn’t write the one below — but I certainly could have! Realistically, some of us will throw it in the trash anyway, but the conflict rages in our head. We know that climate change is a big problem, but we feel powerless. So what are we going to do? I think it’s time to raise the bar — to do more than just change a light bulb. Listen to your green conscience, then choose to do something ambitious that will have a real impact in your life. I call it doing the hardest thing first. Because it’s far more satisfying (and fun) to do something that is making a difference. 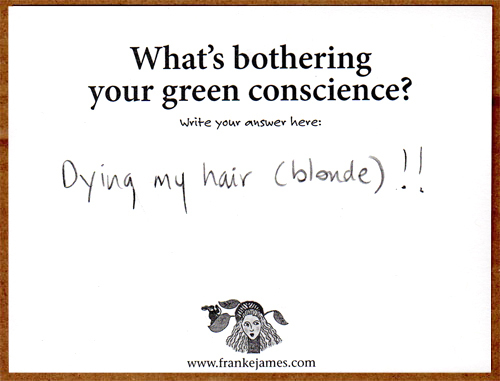 What’s bothering your green conscience? #1. 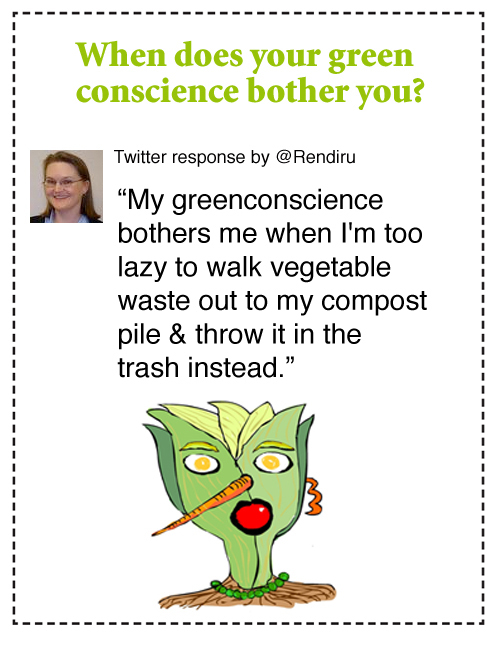 Identify: What’s bothering your green conscience? Is there something you do daily that nags at you? Here are a few ideas to get started: throwing paper in the trash rather than recycling, using paper towels, buying imported food, using harsh chemicals on your hair, getting a ride to school in a gas guzzling vehicle… The list goes on and on. What really bugs you? Highlighting my hair bothers me. 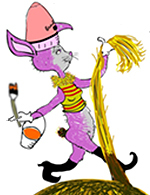 See my visual essay which explores the whole messy topic: The Beehive and the Hairball. #2. Analyze: How big an impact does it make? 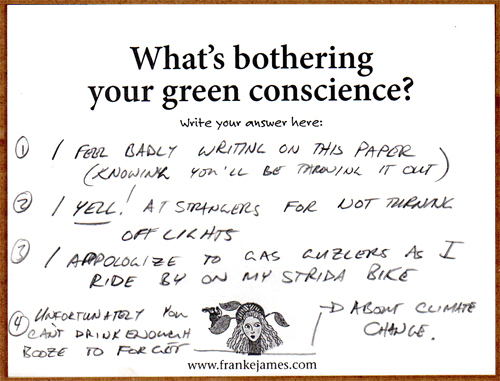 What did you identify as “bothering your green conscience”? Take that specific action and analyze it’s impact on the environment. How big a problem is it? For example if your school has 500 students in it, and every student did the same action as you — what impact would it have on the environment? Write your numbers down. Now multiply that action across your city or town. And then across the country. How big an impact does it make? What would it take to get you to change your behavior? What incentive would make you want to stop doing it and start taking positive action? How would you persuade others? Would earning marks for it make a difference? Play with the numbers from step #2. If 50 students changed their behavior, what difference would it make? #4. Act: Do something green. And document it. 1. Find a way to fix it (temporarily anyway). 2. Plan out your positive green action. 3. What impact does your action have on the environment? 4. How does it make you feel? 5. Observe your response to your new action. Is it hard to do? Will you keep doing it? 6. 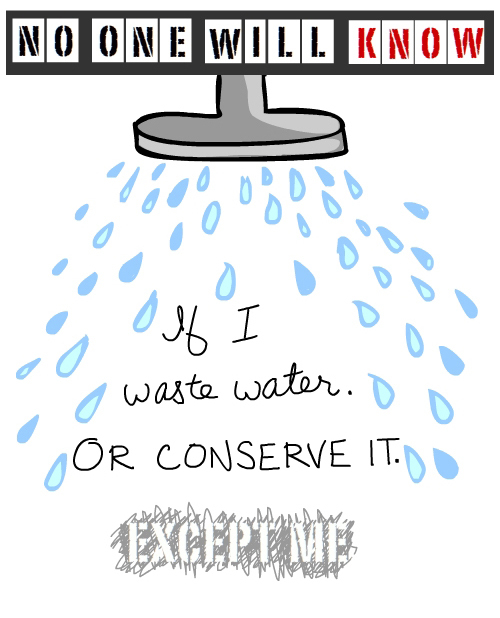 What reactions do you get from other students to your green action? 7. What does your family think? Consider a range of mediums to document it. Writing is an obvious one but also consider performance art, poetry, dance, music, etc. The important idea is to do something green and then tell other people what you did via whatever communication medium appeals to you (and if you’re doing this for a class — your teacher). If you’re really clever, maybe you’ll find a way to get the attention of news media for your good green action? (Just make sure you stay on the right side of the law.) 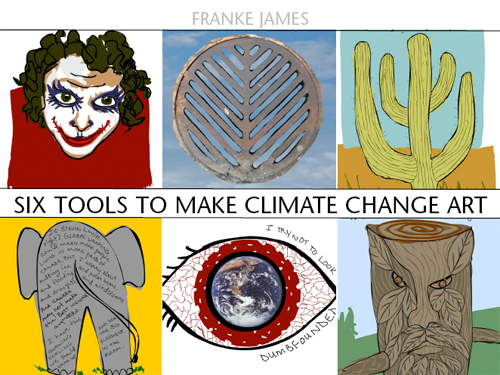 Amplifying your message via radio, TV, newspapers, blogs, Facebook, Twitter and YouTube should earn bonus marks… because spreading the message that each of us can make a difference by taking action on climate change is what it’s all about. 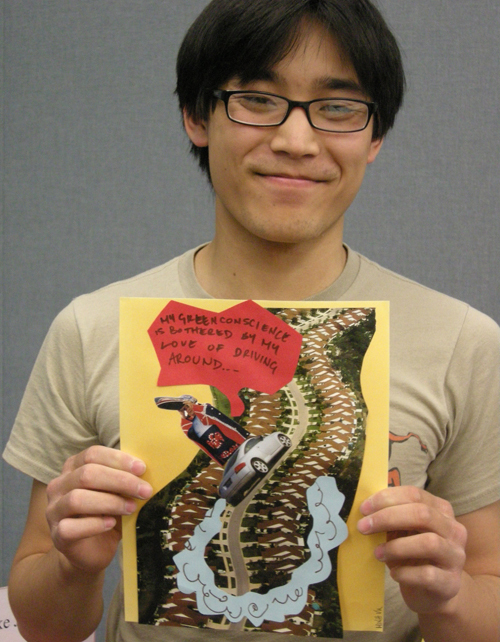 Have fun learning and exploring your green conscience.